There are many lists of items that people should have during times of disaster. Every list is dependant on the circumstances you may find yourself in. With the slowly rising tide of tyranny in America it is important for Americans to remember how we got here and what we may need to do to maintain a Constitutional Republic in the future. When you hear the words citizen soldier it beckons the image of national guard soldiers heading off to training. It is important for you to realize that virtually every adult American citizen is a citizen soldier. In many states you not only have the National Guard but also the navel militia, the state defense forces and the unorganized militia. This is because every citizen bears the burden of protecting our heritage and our rights from those that would try to deprive us of them. In the weeks and months ahead it may become necessary for every citizen soldier to do their part in preserving those precious liberties that we now find in perilous waters. In order to do an effective job in defending those liberties it is necessary to own certain items that can leverage your abilities and help insure victory. The following items are some key elements that a soldier needs to have to take the fight to the enemy and insure continued combat effectiveness. A good rifle is an imperative in a hostile environment. It is easy today to find older military rifles that are still capable of serving your purpose. While civilian rifles will do, military rifles are designed to better endure the combat environment with fewer problems. While a good quality military rifle is best, when the time comes that you need one, any rifle that you are proficient with will serve you better than a club. A rifle is not much good without ammo to feed it. If you are contemplating the need to operate in a hostile environment for a prolonged length of time you must insure you will have sufficient supplies of ammo to carry you through to the end. It is difficult to determine the exact amount you will need in future encounters so you need to buy as much as you can now while it is possible to get it. You should also make allowances for utilizing captured supplies of ammo. This is why a military caliber weapon is best. Any good infantryman will tell you, a good pair of boots and good quality socks are imperative for long operations conducted on foot. If you are operating as a citizen soldier then it is likely most of your movement will be on foot. For an infantryman his feet are one of the most important pieces of equipment he has. You must maintain your feet in combat no matter what. These are two pieces of equipment you do not want to skimp on. Buy the very best you can afford. The wars in Iraq and Afghanistan have given us statistics that are vastly different from previous wars in one regard. The number of killed is relatively low and the number of wounded very high. This is due to the body armor that troops now wear. Many soldiers that would have died from their injuries in past wars are now surviving to make it home. Body armor gives you a decided edge in combat and allows you to survive newer weapons with more likelihood. The psychological effect of knowing you can survive a direct hit allows you to be more aggressive and press the attack. In modern combat the U.S. military owns the night. This has been accomplished by the pervasive use of night vision equipment. The ability to conduct operations day or night with equal ability allows you to choose when and where to attack the enemy. It no longer gives him the ability to relax during hours of darkness. Even a simple monocular can give you significant abilities and allow you to move at a time of your choosing. A chemical protective mask is a critical piece of equipment on the modern battlefield. The use of chemical and biological agents to kill or incapacitate troops is more likely than ever. New agents that can incapacitate to varying degrees are constantly being developed by militaries around the world. The ability to continue the fight after these weapons have been deployed by the enemy gives you the ability to continue the fight and deny areas to the enemy he would otherwise get without a fight. The use of rubber gloves and full body suits may be necessary depending on the agents used. This is one item that might be the most useful and necessary. Without spiritual guidance, combat can devolve into something tragic. It is easy for prolonged combat to escalate into barbaric acts. History is full of tragedies that should not have happened. Without a moral compass to guide you through the worst of times the ultimate victory may not be worth winning. A small pocket bible can provide comfort when there is only pain and nourishment when there is little. These items are not the only equipment needed by citizen soldiers but they are the most important in many ways. While some of these items are expensive and beyond the ability of many to buy all at once, the acquisition over several months is possible for many. Each of these items has the ability to keep you alive and combat effective to fight another day. When the balloon goes up you may only have the equipment on hand at that time to fight with. Anything you lack will hamper your effectiveness for the duration of the campaign so the sooner you can equip yourself the better off you will be when the need arises. Good equipment means life, and your life is not expensive, it’s priceless. The core of all the financial and moral damage done to the U.S. over the past few decades can be traced back to the abuse of federal powers by government officials at all levels. Government has slowly usurped the constitution by adding and interpreting powers it never had. The lack of education by recent generations has allowed this transformation to occur right in plain sight with little or no outcry. The government has enabled this complicity by the population by literally buying it. The sale of freedom and personal rights was never so cheaply bought. The money changers and printers of false prosperity have stolen the physical wealth of the nation for decades and the end is in sight. The wealth many think they have will soon be revealed for the illusion it is. The savings of a nation have already been looted and now resides in the possession of others. The destruction of financial records and savings accounts will be the conclusion of this grand show of manipulation and outright theft. The result will be unmitigated chaos and destruction as a nation of soft malcontents loses all of the distractions that keep them quiet and controlled. The masses will suddenly rush into the streets to acquire the things they need and no longer can afford. The final act of treason will be the elimination of the constitution and its protections as government seizes total control under the guise of saving the nation from itself. Most of the people will fall to their knees and hail it as a great event as government assumes the role of caring uncle. A ruling body, regardless of the type , only has the power allowed to it by the people under its control. Even the threat of force will only carry a tyranny so far. When the people finally say no more, that effectively begins the reduction of the rulers ability to fully control a nation. Control is only possible when the majority comply and the rest can be coerced by the amount of force available to the ruler. In the case of the U.S. the people must first come to the revelation that they have the power to revoke government power just by saying no. When the populace decides to revoke the legislative power granted to the federal government the federal power will then be limited to the amount of physical force it can project on the population. The current buildup of federal agencies is clearly a sign the federals know this eventuality will soon come to pass and they are preparing for it. If the people speak out in a unified voice before the preparations are complete the federals will have limited options. If the people do not voice their opinions in time there will only be one option left to them to restore the constitutional protections that is their birthright. Unfortunately, the current disposition of the masses indicate that any collective act against government overreach is unlikely until it is too late leaving the final option to be utilized. If revolution comes it will be born in the dark of night with a crash of the door as federals attempt to force their way into your home. Those that present the greatest threat to federal authority will be the first on the battlefield as they awake to the sound of a thundering hoard bearing down on them as they attempt to protect their families. These first few martars will be the alarm that activates the prepared masses for a long and bloody revolt. The federals will likely take down the communications ability of the masses prior to military engagement to prevent the dissemination of information over long distances. Any type of grid failure or EMP type attack should be viewed as just such a signal to act. The revocation of federal power at the state or county level is the only option to rebuke the federal position of lawlessness in a peaceful way. As a last line of defense, county governments revoking federal authority in their jurisdictions must be able to project sufficient force to back up their actions. A sufficient number of county governments revoking federal power will form the nucleus of a future resistance that will either grow to overwhelm federal control or succumb to federal forces and never rise again. The more territory a resistance element holds, the more federal forces it will take to subdue that area. The only way to remove federal control permanently is to force them to use more forces than they have, depleting their pool of manpower while eventually removing corrupt officials from office. The tea party has noble goals but the attempt to replace federal officials is a futile gesture at this point. The federal levers of control have already been bought and paid for by those that are truly in control. The best that true patriots can do is to take back the nation one county at a time by installing a constitutional sheriff and county officials in local elections. Once enough counties are controlled the state level can be pursued. The majority of the population that sold itself into serfdom will resist any changes until they suffer sufficient pain and deprivation to make them want a change. This is the battle patriots are now fighting with various levels of success. There is always a peaceful way to resolve most situations but that window is rapidly closing. Bismark may have been right. The great questions of the day will be answered not with speeches or majority votes, but by blood and iron. So, you’ve got your food all stored away to last the next several years. You have your fuel barrel full and your generator and solar panels ready for the end of the power grid. You have enough weapons and ammo to deal with anything. You are mentally and physically prepared for the long hard days ahead. You are prepared to fight the war that will eventually show up at your front door someday in some form and for an unknown length of time. You are prepared for the chaos, but are you prepared for the eventual peace? At some point, the situation will stabilize in some form. It will become possible to walk down the street without being shot at. It will become possible to reopen businesses or to barter. It will become possible to breathe a sigh of relief. When that day comes, how will you survive? You probably have your stash of silver or gold and some barter items but how long will that last? When the system goes down it will take most peoples jobs, their savings, their retirement accounts and pensions and much of the property they thought they owned. Everyone will be forced to start over again. It could be years before the job market is functioning again. Until then, how do you plan to take care of yourself and your family? What is your plan to generate some income to live on and acquire the things you need? Surviving the chaos will be a full time job but when it’s over, then what? Your gold and silver will take you a long ways but they only provide you with a temporary solution to your future needs. At some point you will need to start saving for the day when you are no longer able to do useful work. Most people are busy preparing to just survive the coming chaos but some thought needs to be given to the day after it all ends. Even a few minutes spent now developing a basic plan will be critical to helping you transition to the new normal. A basic idea and the acquisition of a few basic tools or supplies to help you develop your new income stream will help you leverage your time and supplies to get by in the future. Knowledge is the primary tool you need to navigate the future. Knowing how to make physical things or repair things will help you meet the future needs of society. Next to that, the storage of tools, machines, raw materials and information relevant to start a new business needed by the community will give you an edge. In a prolonged period of chaos much of our infrastructure will likely be destroyed. In the aftermath, those with the skills and tools to rebuild will be a valuable asset to society. 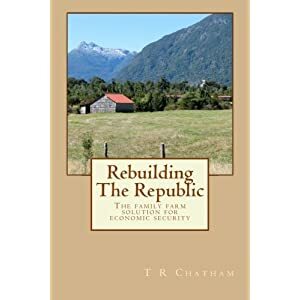 The ability to repair vehicles or machines, carpentry, masonry, plumbing, electrical, healthcare, farming and skills to build physical products will all be needed by a populace that wishes to regain some of the creature comforts they have lost in past years. The more skills and materials you have when that day comes the sooner recovery can happen. Some may say it is a bit presumptive to plan for a day when things get better but if you feel things will never get better then why prepare to get through the worst of times at all? If you have the courage to plan for difficult times then you should also give yourself the ability to enjoy the day when things get better. Planning ahead for the distant future was never more important than it is right now. The ability to produce clean drinking water has allowed modern society to control many diseases and keep people healthy. In a severe disaster you may be confronted with the specter of contaminated water. The ability to produce clean water and remain healthy when medical resources are limited will help provide an edge during disasters. The easiest way to purify water is to boil it killing all harmful organic organisms. This is something many do when water supplies are suspect. In a disaster this may not be enough. Organic threats are only one problem. Disasters can unleash chemicals and harmful particles into the ecosystem that cannot be made harmless by heat. Many of these threats may not be known by you until they accumulate in your system and suddenly cause disabling affects. The ability to construct a filtering system from locally available materials will give you one more wall of defense against unnecessary sickness. The following links provide a good starting point for making your own filters. Many people dream of the day when they are wealthy and can leave the workplace behind to enjoy life. But what are they really thinking about when they dream of wealth? What is their definition of wealth? How do they know when wealth has been achieved? The modern definition that many people would use would be the accumulation of enough money to do what they want without working anymore. To that end, most people build up a savings account, pension account, stock portfolio or other type of retirement account. What do these things have in common? They all represent digits in some computer somewhere. If you had one million dollars in a bank account you might consider yourself moderately wealthy. But what would that mean? If the bank suddenly lost your account information would you still be wealthy? If you had one million dollars in cash and the money suddenly became worthless would you still be wealthy? Money in the form of cash, computer digits and other types of paper are merely a means to store current excess production for later use. This type of storage carries a considerable amount of counterparty risk and is not necessarily the best means to save for the future. This type of wealth is potential wealth. That means it does not become actual wealth until you actually use it. A dollar in your pocket or a dollar in the bank is nothing more than a claim on goods. Until you actually cash it in for something it does not matter how many dollars you have in storage. Once you cash it in you become wealthier. This is achieved by getting possession of physical goods. Something you can use for some purpose. If your neighbor has a million dollars in the bank, a large home with a mortgage and a new Mercedes bought on credit, and he suddenly lost the million dollars for some reason, what would his net worth be? If you lived down the road and owned two acres of land with a clear title, a 35 foot travel trailer and an old pickup truck, and the banks closed or money suddenly became worthless, who would be in the better position? You can be sure the bank has paperwork showing he does not own the home or the new car so what would they be worth to your neighbor? True wealth is the possession of real goods. Some people buy more practical things but all physical goods represent your true wealth. Those that are practical will have goods that are not only useful but can actually earn more dollars which can be used to obtain more real wealth. These can be classified as capitol goods. Goods that are worth potentially more than the purchase price. Things that have production capability like an ax, a sewing machine, a set of tools, machining equipment, knowledge, farming equipment or livestock are things that have some capability to generate money. Land that can be built on or farmed, an old truck, a rifle, a wood stove, quality furniture, art or antiques, gold and silver, a wood lot and even a pile of scrap metal all represent true wealth. They are physical things that you can hold and use and trade for other things at some future date. When the wealth that many people think they have suddenly disappears and the computer digits no longer exist, the only true wealth that will exist will be the things that people physically hold in their hand and own free and clear. If you want to know how wealthy you really are just look around you at the things you really own. In the end that is the only real wealth you may have if all of the potential wealth you entrust to others suddenly disappears into the make believe world from which it came.